The Memory of Earth Orson Scott Card Volume One of Homecoming, book in a good condition, all pages intact. 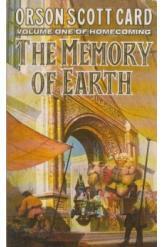 The Memory of Earth begins a new five book series, creating a society on the planet of Harmony. It is a saga of people's return to Earth and will never be forgotten.